Dark shibuichi. 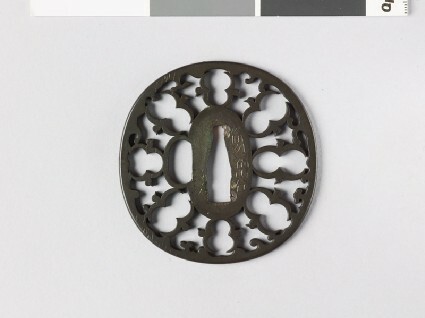 Openwork design; a ring of 16 karigane (the heads carefully cut, with eyes and beaks), symmetrically set in addorsed pairs, unites the seppadai and kozuka-hole to the narrow bordser, the internal profile of which is cut to represent waves. Wada quotes (p.243) a guard by Kawai [Japanese text] Masatsugu of F. in B. of the year 1665; this is clearly later than that date. Shibuichi is for some unexplained reason a very unusual material for an openwork design of this character.